This morning we woke up early and began pulling out the Christmas decorations so we could get most of that put up today. After working for a couple of hours, I decided it was time for brunch. As I scanned around the fridge to see what I could whip up fairly quickly...I spotted the leftover roasted chipotle brussels sprouts as well as the leftover sliced mushrooms from last night's dinner. 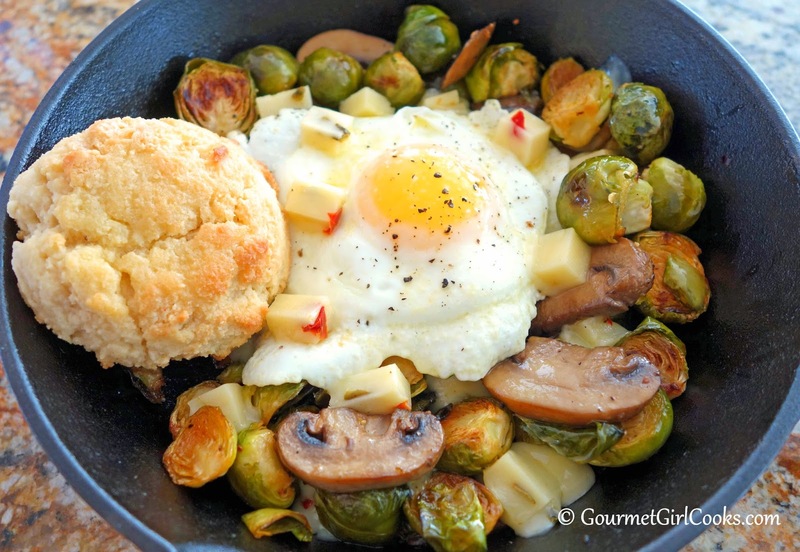 That pesky little light bulb went off in my head and suddenly I was envisioning sprouts and shrooms "hash" browned in butter, topped with a sunny side up egg and some diced Cabot pepper jack cheese. 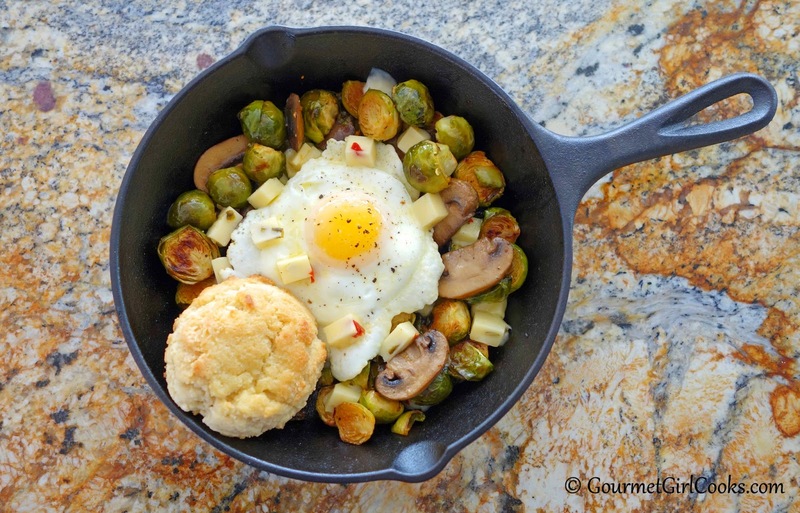 I pulled out my little 8-inch cast iron skillet and added some butter and when it was sizzling, I tossed in the leftover mushrooms and sprouts and seasoned them with a bit of sea salt and black pepper and browned them in the butter. In a separate small skillet, I cooked myself a sunny side up egg. I slid my sunny side up egg over on top of the shrooms and sprouts "hash" and scattered a bit of diced pepper jack cheese on top and let it get a little melty. I added one of my Southern Style Buttermilk Biscuits and Voila...I had an awesome and easy brunch using odds and ends leftovers from last night's meal. I love re-purposing leftovers, that might have otherwise gotten tossed out, into something new and delicious. Enjoy! Bet one could make this with just about any kind of leftovers. Now, why didn't I think of this? The breakfast roll adds the right touch, too.